The meeting of the Kickstarter appearances happens on this page! We have some of the mummies (Greg Noonkester and Steu) meeting the human kids (Eldar Brahm, Melissa Tidd, and Kim Bozek). Thankfully, THIS round goes to the human kids. But don’t worry – there will be more from these appearance characters yet to come. 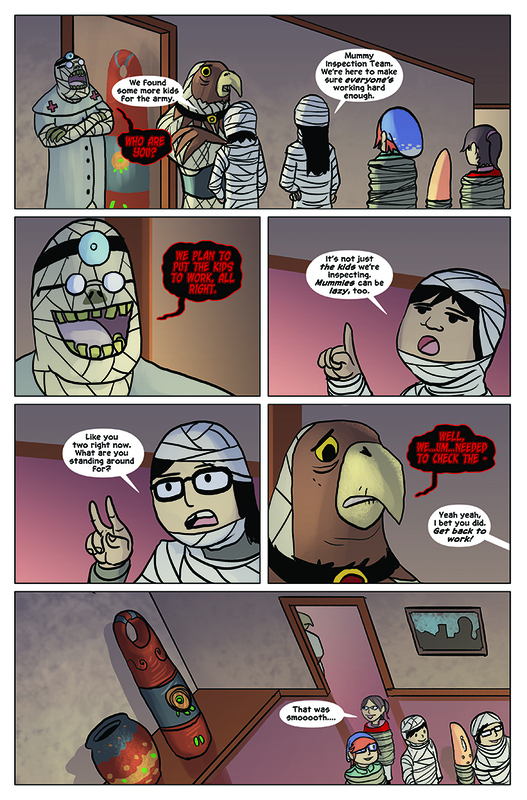 When I first conceived of this story of a mummy coming back to life, I wanted to have the kids sneak past them using everyday stuff on Earth. I remembered rolling myself in paper towels, toilet paper, whatever to try to pretend to be a mummy and thought, “Wouldn’t it be funny if you had to do that in a semi-serious situation to try to blend in?” I wanted the kids to have to sneak past the mummies and trick them with this simple disguise. The mummies wouldn’t know any better – heck, they don’t know what toilet paper is! In any case, Gerty’s plan seems to be working so far. Can the kid’s luck keep up? Find out next update – every Wednesday and Friday – here at www.AlbertTheAlien.com!